Research firm Markets and Markets has predicted that by 2023, the Digital Out-of-Home (DOOH) market will reach $26.21 billion. 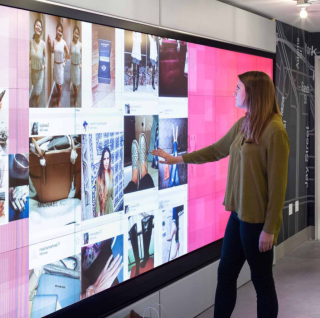 According to the firm, North America is leading DOOH with its early adoption of the latest display technology, with retail and hospitality being the strongest commercial players in this realm. But the opportunities don’t stop there, and AV design and integration companies stand to benefit as corporate campuses, banks, government agencies, and public and commercial transport bodies all explore how digital signage—specifically, interactive displays—can assist in the distribution of advertising, entertainment, and information. Along these lines, Carousel Industries is in the process of rolling out a project that will equip the state of Florida’s Department of Motor Vehicles (DMV) locations with interactive displays, as well as videoconferencing technologies. The systems are designed to serve as remote tellers that drivers may interact with in an effort to facilitate the license renewal process, explained Brian Fichter, director of portfolio strategy, video collaboration, at Carousel. “I think remote tellers will continue to grow—I think it keeps the costs in check for the different [agencies], and it centralizes and streamlines processes,” he said. And, it may make having to deal with the DMV a little less unpleasant. On a more modest level, Fichter points to the development of “all-in-one” displays that incorporate interactive capabilities, audio, cameras, and features such as white boarding functionality as good solutions for smaller deployments. “There is still this craze for small to medium-sized huddle rooms, and these all-in-one displays fit that model nicely,” he said.